YOUR Pictures Of Kites - Shop-Bought or Home-Made. The pictures of kites featured below are contributed by visitors to this page. Except for the huge white Delta further down this page, which I snapped at a recent kite festival. In my view, the visuals contribute a lot to the pleasures of kite flying. How these creations fly, home-made or otherwise, is only half the experience for most people. 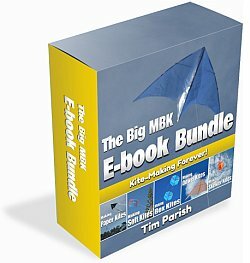 The Big MBK Book Bundle is a collection of downloads - printable PDF files which provide step-by-step instructions for many kites large and small. Yes, you can upload up to 4 images. Handy if you can't decide which one is the best! I'll comment on every submission that I approve. Ideas: If it's an in-flight shot, you could ramble on about the weather at the time, how the kite behaved in the air and even such things as the reactions of onlookers or the antics of curious birds flying around the kite! Telling the story behind this kite picture is easy to do. Just type! Just click the button and find the image on your computer. Then select it. I have flown my kites in December before, but yesterday was my first Christmas Day flight. Beautiful day. Kea Kites - Can a kite help to save an endangered species? My attempt at making a bird kite - with inspiration from George Peters' kites that I viewed online. Photo of a good-looking home-made kite. On-the-ground close-up or an in-flight shot, it doesn't matter. 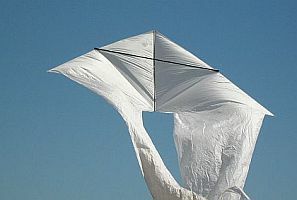 Just fill the frame with the kite, and try to ensure it is well-lit by sunlight or flash. Nice photo of a shop-bought kite, or kites. Some of the pricier ones are very tastefully designed! Great kite photo, where the art is in the photo itself. In this case, it doesn't matter if the kite isn't in the foreground. Pictures of kites straight from your camera can be uploaded successfully. However, transferring these large raw digital images can take many minutes over a slow Internet connection. Re-sizing the image to around 100Kb or so will still result in a high-quality image on a computer screen. For maximum impact on my site, a photo that's taller than it is wide works best. This way, when my site re-sizes the photo to fit the page, it will appear as large as possible.